A Frenchman's search for relatives of a Welsh soldier killed in World War One has proved successful, thanks to social media. Louis Sabos found a photo of Pte Henry Davies near Canonne Farm British Cemetery, and wanted to trace his family so he could "honour him". He contacted Pembrokeshire Archives which put out an appeal on Facebook and within an hour was contacted by Pte Davies' great niece, Claire Phillips. 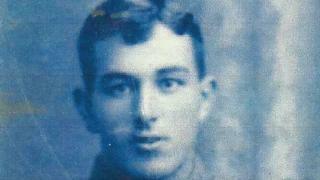 Pte Davies died on 4 November, 1918. He was from the village of St Nicholas, near Fishguard, and served with the South Wales Borderers which fought at the Sambre canal near the battlefields of the Western Front. Mrs Phillips said the family had carried out a great deal of research into his life. Her husband Bob wrote a short film about him, called Gathering the Graves, which premiered at Llangwm Literary Festival this year. He said it was an "incredible coincidence" that Mr Sabos had been looking for the family of the soldier which had inspired his film, and he was "looking forward to making contact". The mystery of how the photograph was found near the cemetery was also solved. Pam Harries, whose grandfather was Pte Davies' brother William, said she left a photograph of him at his grave when she visited the cemetery in 2015. "It was just so peaceful there, and I was so pleased that we went," she said. "But I never thought it would be as emotional as it was." Pte Davies' niece Maureen Edwards also contacted the archives to say that she and her sister Dilys Thomas, who will be 99 this week, are the daughters of Pte Davies' brother George, who received a military medal for bravery. Mr Sabos, who lives in Sommaing, northern France, said he was very happy that so many of Pte Davies' relatives had come forward. He now hopes to receive news and photographs of Private Davies' short life.